Life is too short for bad tenants. Bad tenants are labor intensive, expensive, and a nightmare to deal with. A landlord’s job becomes infinitely harder when the wrong people slip in under the radar – they can have a negative affect on the whole neighborhood. That’s why it’s so important to thoroughly screen tenants in Tucson before you let them sign. You need to know what you’re getting yourself into before it’s too late to turn back. Screening is extensive, but it isn’t necessarily difficult. Think of all the time and headaches it will save you in the long run. You can create a rental application from a free template or with the help of a professional. No matter how you create it, you want to be sure that it contains the right questions. You’ll need enough information to properly screen the applicant. You need to declare within the application that you intend to perform a screening that involves their financial and employment history, as well as an inquiry into their criminal record. State that by signing, the applicant consents. You’re allowed to retrieve this information – you just need consent in the form of the signed application. Within the application, ask questions about employment history, their current income, what their expenses are, and who they’ve rented from previously. Ask for references, including those of current and former employers and landlords. It also helps to know ahead of time how many people will be living in the rental, and how many pets they intend to bring with them. A background check in Tucson can be run with a full name and a social security number. There are different options for background checks that will omit or include specific types of information. The best place to start is to run the most comprehensive background check available. This background check will give you information about criminal records, as well as civil records. You might also be able to find evictions through the check, since they’re a legal process. If the background check comes back clean, you won’t need to investigate most of those matters any further. Getting the background check over with from the beginning can save you a lot of exploring. You only need to look further if you find something that you want clarification for. Depending on what state you live in, you might be able to pass the costs of the credit check on to the applicant. If you can’t or you aren’t sure, you’re going to have to pay for it out of pocket. Credit checks can go back as far as ten years, and they’ll provide you with the applicant’s credit score. You’ll be able to see if the potential tenant is dealing with a lot of debt. Debt will affect your tenant’s ability to pay their rent – it’s another monthly expense that’s coming out of their paycheck. You’ll also be able to see any missteps in their credit history, but consider them carefully. Just because a tenant had an account go into collections a few years ago doesn’t mean they’re not going to pay their rent on time. Some people go through temporary rough periods – what matters is the changes they make to repair their financial future. The potential tenant’s employer can’t tell you much, but you might want to call them anyway. Their employer is not obligated to tell you what the employee’s annual salary is, nor should they. They can confirm whether or not the potential tenant works for them, and the duration of their employment. It might be more useful to request the applicant to provide proof of employment via paystubs. These will ultimately provide more information than the employer will. Do this for all potential renters listed on the application. They’re all contributing to the household. It might actually create an even more promising picture when you see that everyone living in the home is competent and capable. You can’t interrogate a former (or current) landlord about a tenant, but there are a few questions you can ask. You’ll want to know if the tenant is all paid up and generally makes their payments on time. If they’ve caused any damage or major disruptions in a property owned by that landlord, you’ll want to know about it. This is a question you don’t want to skip – it’s the closest thing you have to a crystal ball that will show you the future. 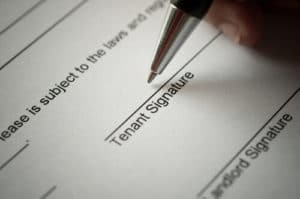 To make sure you aren’t unfairly penalizing the potential tenant, ask them about what you’ve learned. They could have had a bad roommate in the past that they were moving to get away from. If they aren’t directly responsible for damage and the disruption, this is something you’ll want to consider. They could have been dealing with a terrible tenant that they were stuck sharing a rental with. If you think you might have a future with this tenant, it’s time to give them a call. Asking a few lifestyle questions can give you the information you need to make a final determination. Will they frequently be leaving the property empty while they travel? Do they think they might want to get a roommate? Do they work odd hours, affecting what times you may be able to stop by? Do they have a large dog they’re going to bring with them, and is that dog well behaved? If you like what you hear, it’s time to get the lease ready. Confused? Overwhelmed? Need Some Help? Screening tenants is a complicated process. In fact, every aspect of maintaining a rental is a complicated process. If you’re just looking to get some income from your property, you can always turn the job over to a property management company in Tucson. That just so happens to be exactly what we do. If you need help handling your rentals (especially filling them with great tenants), give us a call. We’re very experienced.